We were surprised to find that our first run of the formal report on the Whitfield Syke Project sold out so quickly over the summer and our second print run has now almost gone too. 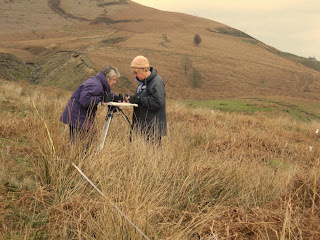 On Friday 18th October, Pat, Alison, Ruth and Jane gave a presentation to local residents at Embsay Village Hall to give them a summary of our findings from the Whitfield Project. This was a rather more relaxed affair than at the Historic Enirvonment Day at Grassington in April - we were able to expand a little more and use a full hour rather than keep to the very tight schedule of just 40 minutes we had before. It seemed to go very well - a lot of people chatted to us afterwards, asking questions, telling us more local information, and expressing concern that the old Mission Building was decaying so rapidly. Many people said they had walked past the building so often and never realised its fascinating history, and now wished to see it preserved. On Saturday 13th April 4 members of UWHG bravely stood up to give their presentation on the Whitfield Syke Mill project at the Historic Environment Day held in Grassington by the Yorkshire Dales National Park. It was a big day for us, the culmination of 3 years of hard graft and research. Three of us – Pat, Jane and Ruth – were new to this business of public speaking, but Alison had done this kind of thing before. It was a nerve-wracking wait through the morning as we watched other speakers go before us. At lunch time we were invited to join the other speakers, the organisers and volunteer helpers at a buffet lunch, but we were too nervous to eat much. Although I managed a bit of chocolate cake after a nibble at savoury offerings! Then suddenly, after months of preparation and anxious waiting, we were on. It all went surprisingly well, despite some microphone problems – and nervous twitching on the remote control which sent our powerpoint slides jumping around all over the place. We tried to provide a mix of academic research and light-hearted anecdotes, which seemed to go down well. People were very kind about it afterwards, anyway. Now, if we give any more talks on the subject, they’ll seem like a walk in the park! 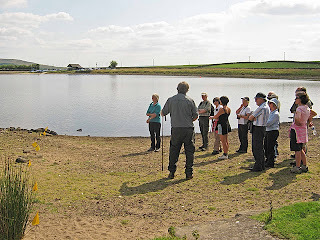 The guided walks for the Festival of British Archaeology were a great success, informing approximately 60 members of the public and UWHG members about the Whitfield Syke Mill complex. ﻿Each walk followed more or less the same format, only being slightly adapted for the different parties. The “dry run” for UWHG members proved to be very wet indeed in the rain, but all members battled valiantly on, in spite of getting soaked! The following weekends proved to be exceptionally hot and so were taken at a more leisurely pace. 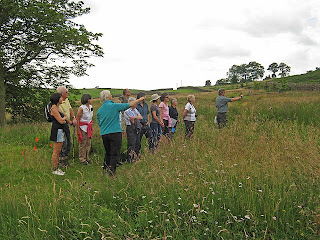 Having met in the car park, and following a brief introduction by Ruth, we walked up the lane, stopping to look at some of Maria Phillips photographs (taken c. 1900-1910) of the mill site on the way and comparing them to the present view. 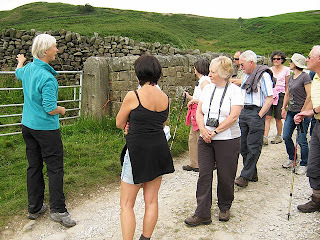 Alison then took over and told us something about the enclosure of Embsay Pasture and the medieval origins of the surrounding walls, eventually leading us on to look at the walls of the reservoir and the remains of the late 18thC cottages now incorporated into this wall. ﻿Chris, assisted by Jane then informed us about the mill, pointing out the various stages of its development, greatly helped by the coloured flags which he and Jane had previously laid out. The former warehouse and its association with Elizabeth Garnett and the Navvy Mission Society, as told by Jane, proved to be of great interest. We then walked back to the moor side, where Ruth indicated the various mill ponds and the cmplex management of the water supply for the mill. Again the coloured flags were useful to indicate the various channels at present obscured by the height of the bracken. 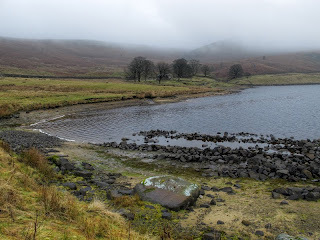 The walk finished by looking at the Weir and the Sheep Wash area. Everyone seemed to have enjoyed the walks and said how interesting they had found them – many people having walked there frequently but knowing very little about the mill complex. They all agreed that their walks in future would take much longer as they would now be looking at walls and buildings, etc in a very different light! We've almost finished writing up our report on the project - it's now in the final stages of editing and proof-reading. It's taken rather longer than we had anticipated due to a busy summer with other projects and committments, but we're getting there. In the meantime we are offering guided tours of the site for the Festival of British Archaeology, a national annual event in which the public are invited to find out what's going on in their area, and to learn a little more about archaeology generally. 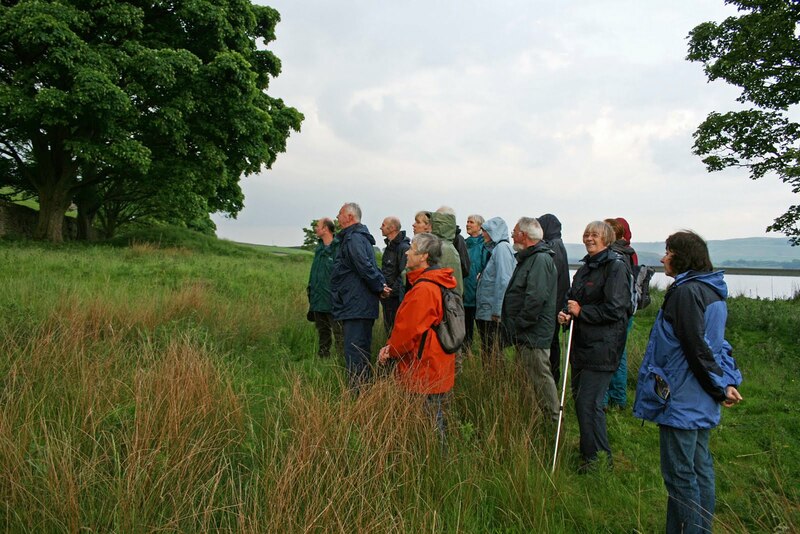 The Whitfield Tour walks will last about 2 hours and will be repeated at 10am and 2pm on Saturday 23rd, Sunday 24th, Saturday 30th, and Sunday 31st July. 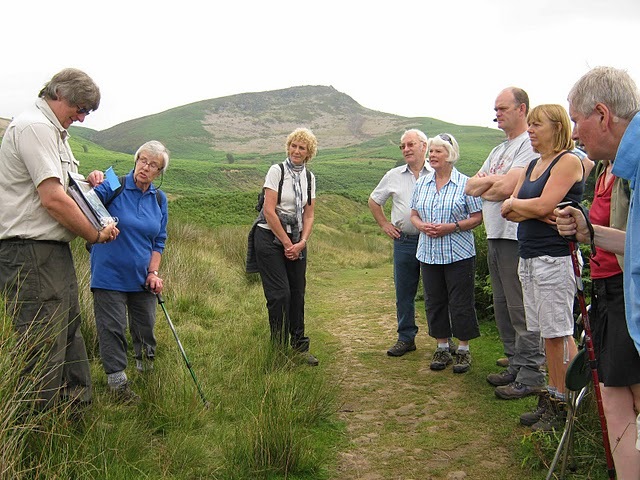 Walking boots will be needed although the terrain will; be easy to moderate, and the pace gentle. Unfortunately since part of the walk is on the moorside we cannot allow dogs. We archaeologists are obsessed with the weather, and no wonder. 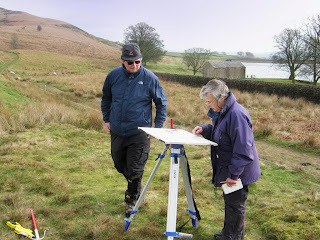 With an encouraging weather forecast three intrepid volunteers met at Embsay Reservoir to finish off the last of the little anomalies in the plans. But there was none of the predicted spring sunshine and summer temperatures - just gusty, biting winds, gloomy skies and drizzling rain. Which all made the measuring difficult - with tapes blowing and pulling in the wind it wasn't easy setting up our base lines up the moorside. And the constant rain and mizzle made drawing awkward. But, we're used to such conditions up here in the Dales, and thankfully we were done and dusted by lunchtime. Back to the fieldwork today. 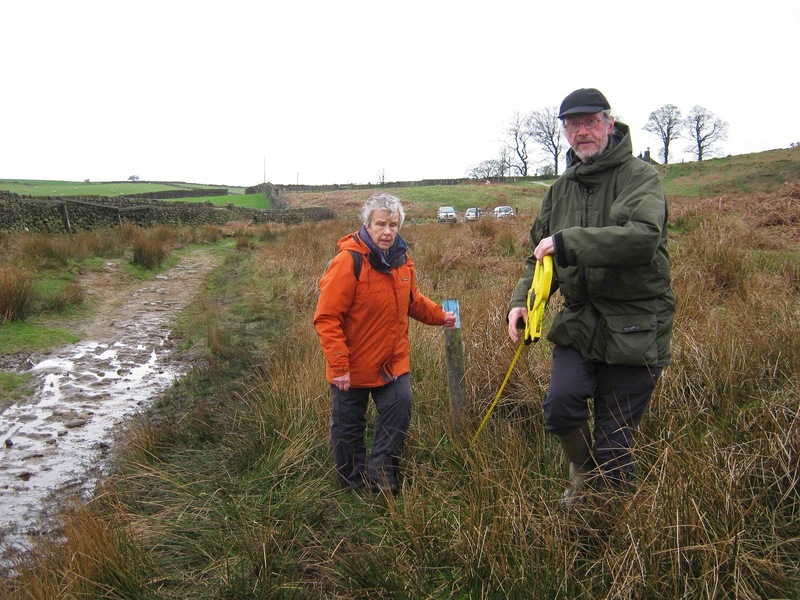 Jane and Alan spent a misty day measuring and describing the botanical zones on the eastern half of the area south of the wall. Despite the very cold weather in December we noticed, with some alarm, that the Creeping Thistles have already have started their regrowth, reminding us how much more we have to do for the botanical survey.